Novice and advanced bakers will surely love using My Lil Pie Maker as it is an amazing set and also allows you to put different fillings to bake a group of various pies at the same time. Whenever you want to bake some mini pies rather than using muffin pans or purchasing individual mold, then use My Lil Pie Maker and delight your family, guests and friends with delicious mini-pies made through this baking kit. Aside from the delectable pies that you can make from it, My Lil Pie Maker also allows you to save money from buying expensive gourmet pies in stores. 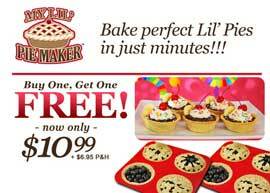 Your kids will surely love the mini pies that you can make with My Lil Pie Maker. This pie maker is also great to use for weekend events and parties with family and friends. Everyone can get their own ideal sized pie and as mentioned earlier, you can make pies with various fillings so this can only mean that all can have their favorite flavors at the same time. My Lil Pie Maker also comes with a recipe guide that you can use to cook other delicious dishes.